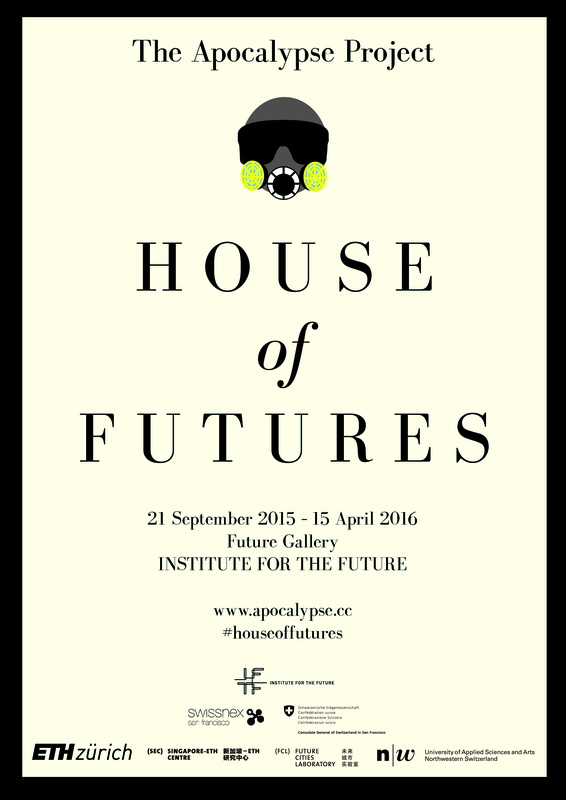 The Apocalypse Project: House of Futures has finally launched at the Future Gallery of IFTF. Free and open to the public, the 7-month exhibition features interactive works that explore climate change and our futures through the lens of high fashion. The exhibition welcomes audiences of all ages. September had a whirlwind of events. My flight from Manila was delayed for the next day, and I was awake for more than 24 hours and carrying very precious and dubious-looking cargo—Metal hats! Climate change perfumes! Apocalypse masks!—that fortunately went through customs without a hitch. Thankfully, things went smoothly and were not apocalyptic when I landed in San Francisco. It was great to physically meet people I’ve been in touch with in the digital world for several months now. David Evan Harris and Bettina Warburg of IFTF, Sophie Lamparter of swissnex San Francisco, and Martin Schwartz of the Swiss consulate have been working on the administrative matters for the exhibition, while I worked on the projects in Manila while Skyping with ETH scientists all over the world. Time was not wasted the minute I landed. It was a Thursday, and David picked me up from the airport and we drove to IFTF where I met some of the staff and saw the Future Gallery for the first time. We went back to San Francisco to the swissnex office, where we did dress fittings for the models who will wear the Climate Change Couture garments. 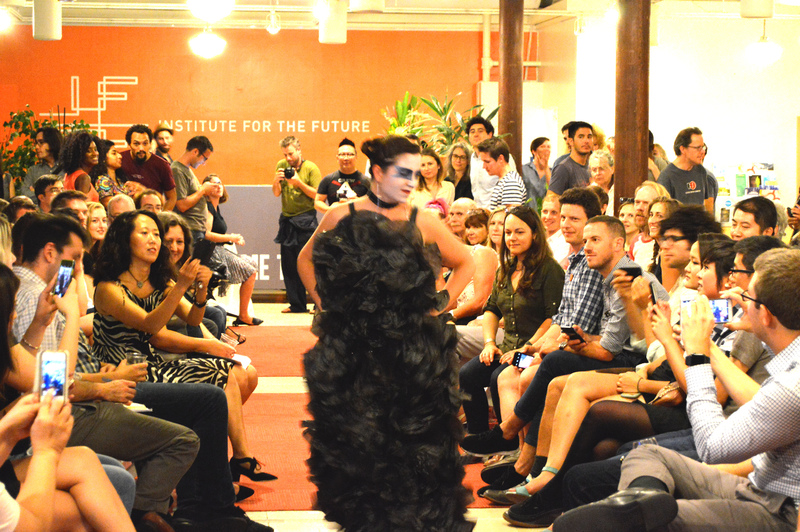 The next day, Friday the 18th, we had a preview of the exhibition at swissnex San Francisco with some art and science talks as well as the first fashion show of Climate Change Couture. 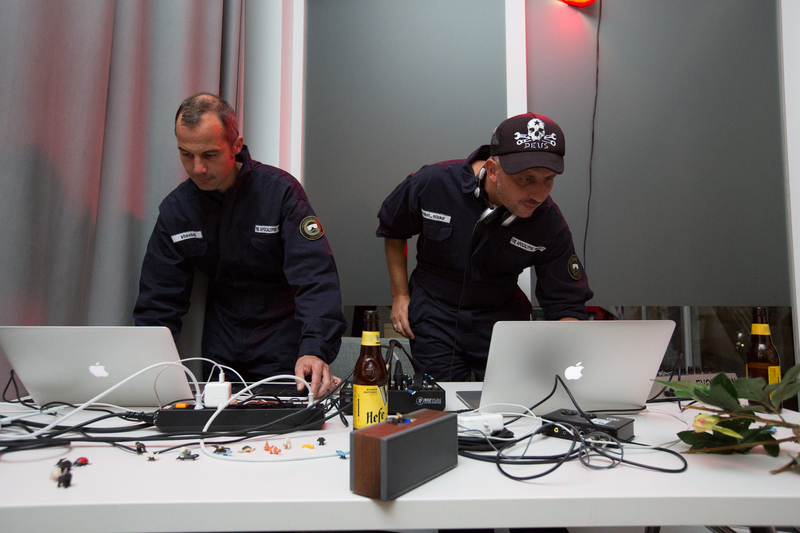 Music and science were provided by scientists-artists-DJs Stefan Müller Arisona and Simon Schubiger. It was great to see them again and work with them and jewelry designer Ika Arisona on The Wild Jewels project. The Apocalypse Project at swissnex San Francisco. Photo by Myleen Hollero. Two days of installation after and on September 21st, The Apocalypse Project: House of Futures finally had its grand opening. With opening remarks by Marina Gorbis, David Evan Harris, Consul General of Switzerland Hans-Ulrich Tanner, and swissnex San Francisco CEO Christian Simm. A big part of the night was Future Feast, where chefs get to propose dishes of the future. 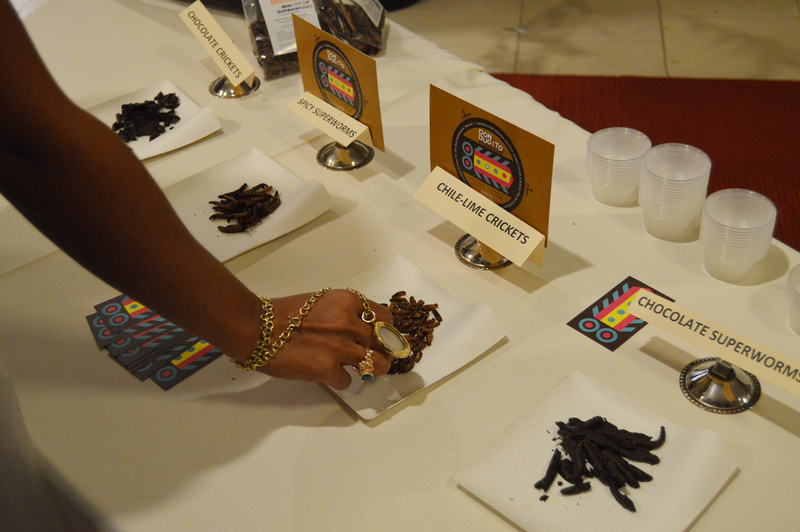 In talk-show fashion, I introduced Vijitha Shyam of Spices and Aroma and Monica Martinez of Don Bugito. Vijitha prepared a delicious ayurvedic meal using vegetables that use less water and are therefore easier to grow in California’s drought, while Monica presented tasty insect dishes made of insects—a wonderful protein source that are easy to grow and has less impact on the planet. Don Bugito by Monica Martinez at Future Feast at the Institute for the Future. Photo courtesy of IFTF. The next day was IFTF’s inaugural Future Now, an all-day event with art and science talks, co-working, a fashion show on the streets of Palo Alto, more Future Feast food, and casual discussions about climate change and the future. Eating great food, seeing models strut their stuff, dancing the night away, and art you can touch and wear are not what you would normally associated with climate change, but these fun and inclusive activities are meant to get you to care about what is often a politicized issue. Climate change affects all of us, and I especially like to engage young people, such as the two little kids who looked at the exhibition on my last day of installation. Jeremy Joe Kirschbaum of IFTF struts his stuff. Photo courtesy of IFTF. I think that the fashion shows were especially fun because of the life the models gave the clothes. Most of them came to me saying it was their first time walking a runway or putting on fancy makeup. There were models who got the call at the last minute, and I appreciated how some of them insisted on an explanation as to why they were wearing these strange clothes. It’s wonderful to work with people who have their own strong opinions and can bring their own personalities to the table., creating a different fashion show each time. 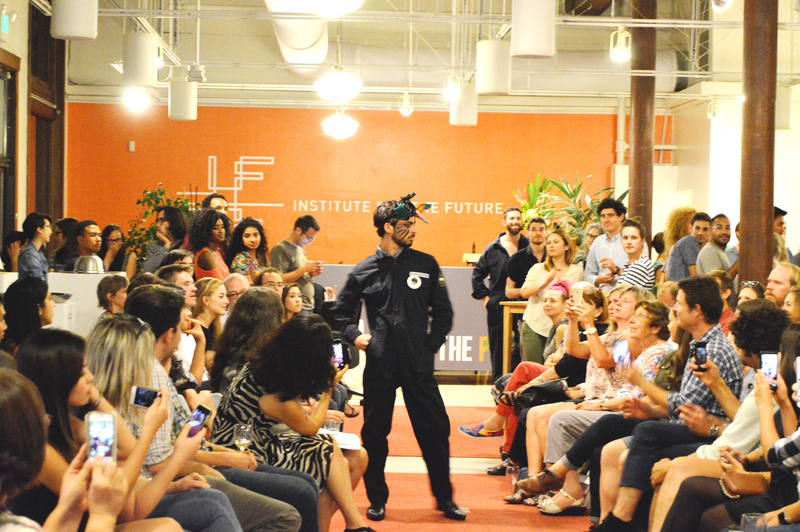 Zoe Bezpalko modeling Climate Change Couture at IFTF. Photo courtesy of IFTF. This has been such as positive collaborative experience—there are many people involved in these events whose names I’m still recalling because of the sheer number. Simon Schubiger and Stefan Müller Arisona DJ the Climate Change Couture fashion show at swissnex San Francisco. Photo by Myleen Hollero. I’m especially excited for this exhibition because I got to work with some old friends who have supported The Apocalypse Project before it was even born. I started this project as an artist-in-residence at the Singapore-ETH Centre Future Cities Laboratory (FCL) in 2013. There, I produced the first collection of Climate Change Couture, designing clothes based on the research of some of the scientists and getting them to model the clothes. This time, for this Palo Alto show, it was a new experience to actively collaborate with them and co-design the garments. Moreover, as this exhibition is registered for ArtCOP21, I am happy for everyone’s efforts to be part of a global movement of cultural awareness on climate change. And to think this is just the beginning! Stay tuned for more activities until we close this show in April of 2016. This post first appeared on the website of the Institute for the Future here. [News] The Apocalypse Project is going to San Francisco! I’m excited to be one of the featured artists for Open City / Art City Festival, a creative and generative event that looks at how we transform a city. The piece I’m featuring is The Ephemeral Marvels Perfume Store, a futuristic perfume line of things that could disappear from the natural world due to climate change. Come smell the perfumes and talk about your memories, and let’s raise climate change awareness! Check out the other featured projects here, and the festival site here.